In the first eleven chapters of Genesis, we were introduced to four crucial events in Earth's history, namely: The Creation, The Fall, The Flood, and The Tower of Babel. Two of these events were directly initiated by God, the Creation and the Flood. And two, The Fall and The Tower of Babel, gave us the story of God's involvement with man at historic turning points of the human race. Now, from chapters 12-50, we will be introduced to four very important people in God’s dealings with man, namely: Abraham, Isaac, Jacob and Joseph. This entire second section of Genesis centers on the Abrahamic Covenant, given by God to Abraham. In chapter 12, we have God’s general promise of it to Abram. Then, in chapter 15, we will see how God made it into an irreversible, unconditional and permanent covenant that has affected all of mankind all the way down to our present day. After studying these chapters, we will better be able to see the “big picture” of the workings of God in history. It would be helpful, as we study, if we would ask ourselves why the Lord has included a particular story or event in his Word. So, make it a habit to ask yourself, Why is this chapter put here? ... and, Why did God include this event in his Word? At times, we may struggle to see how the pieces fit. But, in the end, it will all come together and present us with a beautiful picture of the will and ways of God who chose to reveal himself to these four men who, in turn, became vessels of that revelation to the rest of mankind. Now the LORD had said to Abram: ‘Get out of your country, from your family and from your father's house, to a land that I will show you. I will make you a great nation; I will bless you and make your name great; and you shall be a blessing. I will bless those who bless you, and I will curse him who curses you; and in you all the families of the earth shall be blessed.’ So Abram departed as the LORD had spoken to him, and Lot went with him. And Abram was seventy-five years old when he departed from Haran. When God called Abram, he was living in Haran with his father and family. They had moved to Haran from Ur. When Terah, Abram’s father, took the family there, it must have seemed like moving from New York City to some little burg in Wyoming. However, it was at Haran that Abram’s great adventure with God would begin. Immediately, in obedience to God's instructions, Abram moved out ... moving from that which was secure to that which was insecure ... a venture into the dark valley of the unknown ... simply because God had asked him to. That kind of obedient trust is a rare thing in our world and it is a beautiful thing to behold. So it was with Abram as well. By faith, he obeyed, moving out of Haran at the Word of God. As a result, he would find himself in many a tight and insecure spot. However, it was in those places and circumstances that he would truly get to know his God. If we could ask him, Abraham ... was it worth it? He would surely reply, Absolutely! At this point in time, Abram had no children. In retrospect, we know that God did exactly as he promised, but Abraham didn’t know that. Yet he believed God and, as a result, from him there arose the great nation of the Jewish people. 2. I will bless you and make your name great. Most people in the world today know who Abraham was. The entire Jewish, Christian and Islamic world hold him up as a key figure in their religion. Again, in retrospect, we can see that God was true to his word. 3. I will bless those who bless you, and I will curse him who curses you. Two illustrations of how this promise has worked itself out in human history are found in the Bible books of Esther and Obadiah. In the book of Esther, an Assyrian named Haman plotted to have all the exiled Jews in Assyria put to death and he built a gallows ... on which to hang Mordecai, the central Jewish figure in the book. Remember what happened? Esther, the Queen (a Jewish girl), interceded before the king for her people and Haman ended up being hanged on his own gallows! God's promise to Abraham was working itself out in shoe leather, you see. Also, in the book of Obadiah, we see what happened to the Edomites who made the mistake of cursing the Jews as they were being carried away captive by the Babylonians. For thus says the LORD of hosts: ‘He sent Me after glory, to the nations which plunder you; for he who touches you touches the apple of his eye. For surely I will shake my hand against them, and they shall become spoil for their servants. Then you will know that the LORD of hosts has sent Me. Sing and rejoice, O daughter of Zion! For behold, I am coming and I will dwell in your midst,’ says the LORD. Make no mistake about it, brother. That scripture is a quote from the lips of the Lord Jesus Christ ... and, it will shortly be fulfilled by him! 4. In you, all the nations of the earth will be blessed. First, it is vital that each child of God know what the promises of God are. All of them are right there in the Word of God. Find them, beloved. Memorize them. God put them there specifically for you. Second, each one of God’s children must act upon the promises God has given to them. This is where the men are separated from the boys. Here lies the great difference between a babe in Christ and a mature saint. Mature believers are people who know the promises of God and are standing upon them. Then Abram took Sarai his wife and Lot his brother's son, and all their possessions that they had gathered, and the people whom they had acquired in Haran, and they departed to go to the land of Canaan. So they came to the land of Canaan. Abram passed through the land to the place of Shechem, as far as the terebinth tree of Moreh. And the Canaanites were then in the land. Then the LORD appeared to Abram and said, ‘To your descendants I will give this land.’ And there he built an altar to the LORD, who had appeared to him. And he moved from there to the mountain east of Bethel, and he pitched his tent with Bethel on the west and Ai on the east; there he built an altar to the LORD and called on the name of the LORD. Thus, also faith by itself, if it does not have works, is dead. But someone will say, ‘You have faith, and I have works.’ Show me your faith without your works, and I will show you my faith by my works. You believe that there is one God. You do well. Even the demons believe; and tremble! But do you want to know, O foolish man, that faith without works is dead? Abram’s faith was the genuine article. It was demonstrated by his obedience in leaving Haran. And notice, the minute Abram moved out in obedience, God appeared to him again. Very often, it isn’t until we untie from everything and move out in obedience that God appears to us and gives us further direction and the comfort of his presence. So, Abram received yet another great promise from God. God said … To your descendants I will give this land. Wow! Later, this promise too, would be embodied in a formal covenant and then be re-iterated to Isaac and Jacob and, again, to all the people of Israel in Moses’ day. Later still, it would also be embedded in the Davidic Covenant given to King David. I get the impression that the land of Palestine belongs to the Jews, don’t you? However, their actual possession of it has been quite another matter. They lost possession of it because of disobedience and sin and the rejection of their God and Messiah, Yeshua (Jesus). And, they will never fully possess it again until they repent and turn back to him, the one and only, true and living God. Their God is none other than the Lord Jesus Christ himself. Once they acknowledge him, then he will lead them again into their Promised Land and they will possess it forever … never to be uprooted or displaced out of it again (Psalm 10:20-22; 12:11-12; 53:6; 102:13-22,28; 106:45-48; Isaiah 27:6, 12-13; 30:19; 35:8-10; 43:5-7; 51:11; 54:7; 60; 61:1f; 66:19; Jeremiah 12:14f; 16:15; 23:1-8; 30:1-11, 17-24; 31; 32:37-44; 33; 51:5; Ezekiel 28:25-26; 34:11-31; 36:8-11, 22-38; Hosea 2:14-23; Amos 9:11-15; Zechariah 8). 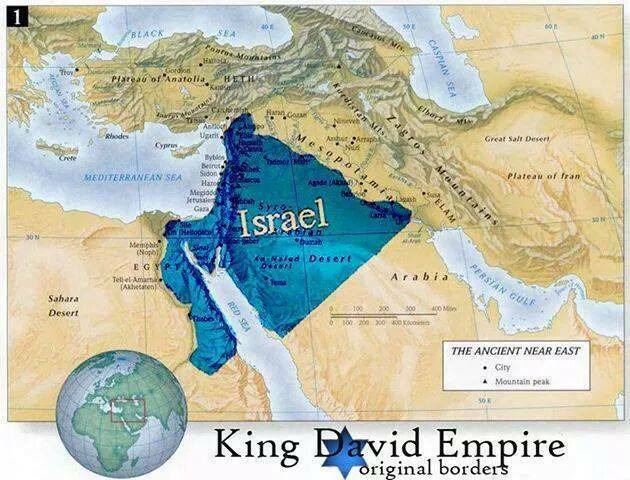 By the way, here is a picture of the extent of the land of promise that God gave to the people of Israel. One more thing, before we move on. Did you notice Abram’s response to God's promise of the land that he was to receive? Immediately, he built another altar and worshiped. This was an automatic response to his inward faith in the word of God that had been given to him. 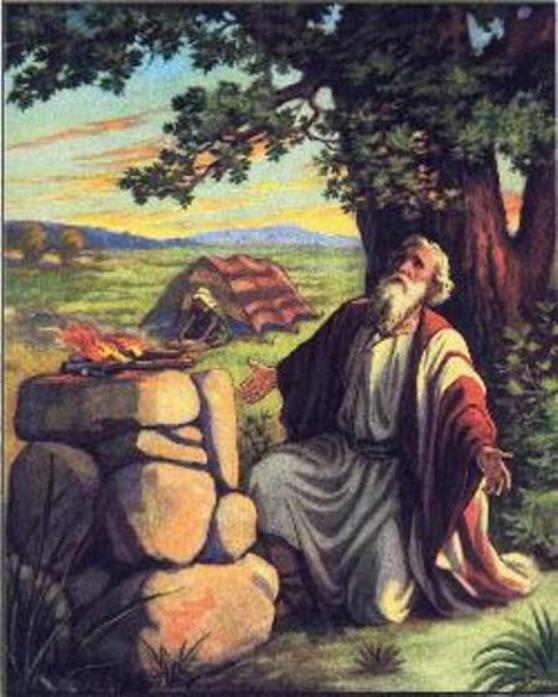 Everywhere Abram went, you will find two things … Abraham's tent and his altar. Worship was a big part of Abram’s life and the bedrock expression of his faith. So it also is, with all who truly believe in, and love, the Lord their God. So Abram journeyed, going on still toward the south. Now there was a famine in the land, and Abram went down to Egypt to dwell there, for the famine was severe in the land. And it came to pass, when he was close to entering Egypt, that he said to Sarai his wife, ‘Indeed I know that you are a woman of beautiful countenance. Therefore it will happen, when the Egyptians see you, that they will say, "This is his wife"; and they will kill me, but they will let you live. Please say you are my sister, that it may be well with me for your sake, and that I may live because of you.’ So it was, when Abram came into Egypt, that the Egyptians saw the woman, that she was very beautiful. The princes of Pharaoh also saw her and commended her to Pharaoh. And the woman was taken to Pharaoh's house. He treated Abram well for her sake. He had sheep, oxen, male donkeys, male and female servants, female donkeys, and camels. But the LORD plagued Pharaoh and his house with great plagues because of Sarai, Abram's wife. And Pharaoh called Abram and said, ‘What is this you have done to me? Why did you not tell me that she was your wife? Why did you say, "She is my sister"? I might have taken her as my wife. Now therefore, here is your wife; take her and go your way.’ So Pharaoh commanded his men concerning him; and they sent him away, with his wife and all that he had. Abram was a man of great faith who had seen the glory of God. Yet, like all of God’s children, he was far from perfect. Often, he would resort to his own thinking and schemes to deliver himself from his troubles. Sound familiar? He was not all that different from you and me … was he? We all have a long way to go. Yet, how well our Lord knows us! So, he causes us to learn and grow by sending trials into our life so that our faith, being much more precious than gold, can be refined. And, ultimately, it will be found to praise, honor, and glory … at the appearing of our Lord Jesus Christ. Worried about his life and safety, Abram concocted a plan. He would go down to Egypt and get his needs met there. Also, he would instruct Sarai to say that she was his sister in order to avoid any unpleasant situation or possible danger to himself. Now, when did God tell Abram to leave Canaan? He didn’t, did he? Remember when Noah stayed inside the ark for nearly two months after the door had already been opened? God had told him to get on board the ark and Noah was not about to leave it until God told him to do so. Abram stumbled in this regard. He just up and left the place where God had told him to be. Then there followed a series of disasters. Right out of the chute, having concocted a half-truth about Sarai (she was, in fact, his half sister), he promptly lost possession of her to Pharaoh. Then, God stepped in and he was found out and called on the carpet and ended up being thoroughly humiliated and unceremoniously expelled from Egypt. Ever been in similar situations? It was no fun, was it? Did Abram learn anything? We shall see. Then Abram went up from Egypt, he and his wife and all that he had, and Lot with him, to the South (Negev). Abram was very rich in livestock, in silver, and in gold. And he went on his journey from the South as far as Bethel, to the place where his tent had been at the beginning, between Bethel and Ai, to the place of the altar which he had made there at first. And there Abram called on the name of the LORD. Come now, and let us reason together, Says the LORD, Though your sins are like scarlet, They shall be as white as snow; Though they are red like crimson, They shall be as wool. Abram was instructed to go to a land that God would show him. He went and arrived there. God said … to your descendants I will give this land. Abram was never told to leave that special place of promise. But, he looked at his immediate circumstances and left the Promised Land on his own accord. The hardship of famine was enough to cause him to step out of the will of God and leave the land where he was supposed to be. Now, he returned to the place where he should have been all along. Upon his arrival, his fellowship with God was immediately restored at the altar at Bethel. Dear saint, are you where you belong … spiritually or otherwise? No? Then go back where you belong. God is waiting for you there. Lot also, who went with Abram, had flocks and herds and tents. Now the land was not able to support them, that they might dwell together, for their possessions were so great that they could not dwell together. And there was strife between the herdsmen of Abram's livestock and the herdsmen of Lot's livestock. The Canaanites and the Perizzites then dwelt in the land. So Abram said to Lot, ‘Please let there be no strife between you and me, and between my herdsmen and your herdsmen; for we are brethren. Is not the whole land before you? Please separate from me. If you take the left, then I will go to the right; or, if you go to the right, then I will go to the left.’ And Lot lifted his eyes and saw all the plain of Jordan, that it was well watered everywhere (before the LORD destroyed Sodom and Gomorrah) like the garden of the LORD, like the land of Egypt as you go toward Zoar. Then Lot chose for himself all the plain of Jordan, and Lot journeyed east. And they separated from each other. Lot took sides with his herdsmen in the problem over the lack of grass for the flocks. I can picture him storming into Abram’s tent in anger and indignation ... can't you? But, Abram’s response was mature and spiritual. OK, Lot, I know how we’ll solve this problem. You just choose whatever land you want and I’ll take whatever is left. Isn’t that amazing? The solution fit Lot to a tee. He made his choice immediately. Notice, however, he made his decision solely on the basis of appearance and personal advancement. He didn’t bother to consult the Lord nor seek the advice of Abram nor give a second thought to Abram’s welfare. Lot saw … Lot chose … Lot moved out. Shortly, we will see that his decision resulted in his becoming a prisoner and, ultimately, losing all that was dear to him. He was like the fellow who all his life had coveted a Cadillac. Then, when at last he had enough money, he rushed out and bought one. But, as he thoughtlessly drove it off the lot, he was broadsided by a garbage truck! Lot’s decision was based on self-centeredness, greed and the lust of his eyes. And it led him into one disaster after another. That’s always the way it is with the carnal lifestyle. And, make no mistake about it, carnality is a chosen lifestyle. So also is the spiritual lifestyle. It too, is a matter of choice. By choice ... we believers live out our lives as carnal people or spiritual people. It is a choice every child of God must make. It’s just that simple. Abram dwelt in the land of Canaan, and Lot dwelt in the cities of the plain and pitched his tent even as far as Sodom. But the men of Sodom were exceedingly wicked and sinful against the LORD. And the LORD said to Abram, after Lot had separated from him: ‘Lift your eyes now and look from the place where you are; northward, southward, eastward, and westward; for all the land which you see I give to you and your descendants forever. And I will make your descendants as the dust of the earth; so that if a man could number the dust of the earth, then your descendants also could be numbered. 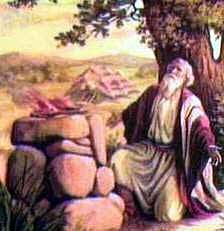 Arise, walk in the land through its length and its width, for I give it to you.’ Then Abram moved his tent, and went and dwelt by the terebinth trees of Mamre, which are in Hebron, and built an altar there to the LORD. So, once again, Abram moved out in obedience … moving all his family and things down to Mamre. Arriving, he built an altar there unto the name of the Lord. And it came to pass in the days of Amraphel king of Shinar, Arioch king of Ellasar, Chedorlaomer king of Elam, and Tidal king of nations, that they made war with Bera king of Sodom, Birsha king of Gomorrah, Shinab king of Admah, Shemeber king of Zeboiim, and the king of Bela (that is, Zoar). All these joined together in the Valley of Siddim (that is, the Salt Sea). Twelve years they served Chedorlaomer, and in the thirteenth year they rebelled. In the fourteenth year Chedorlaomer and the kings that were with him came and attacked the Rephaim in Ashteroth Karnaim, the Zuzim in Ham, the Emim in Shaveh Kiriathaim, and the Horites in their mountain of Seir, as far as El Paran, which is by the wilderness. Then they turned back and came to En Mishpat (that is, Kadesh), and attacked all the country of the Amalekites, and also the Amorites who dwelt in Hazezon Tamar. And the king of Sodom, the king of Gomorrah, the king of Admah, the king of Zeboiim, and the king of Bela (that is, Zoar) went out and joined together in battle in the Valley of Siddim against Chedorlaomer king of Elam, Tidal king of nations, Amraphel king of Shinar, and Arioch king of Ellasar; four kings against five. Now the Valley of Siddim was full of asphalt pits; and the kings of Sodom and Gomorrah fled; some fell there, and the remainder fled to the mountains. Then they took all the goods of Sodom and Gomorrah, and all their provisions, and went their way. They also took Lot, Abram's brother's son who dwelt in Sodom, and his goods, and departed. The next trial that came into Abram's life was a war. It began when four city-kings invaded Abram and Lot’s homeland. I’m reminded of the story of David and Bathsheba, found in II Samuel 11. The first verse of that chapter says it was the time when kings go forth to battle. Apparently, it was also that time of year in Abram’s country. So, four invading kings came into the valley where Lot lived. Five kings from the plain went out against them but they lost the battle and our text says many fell there at the asphalt pits of the Valley of Siddim … a site that was probably appropriate to their sins. In the end, Lot was taken, along with his entire family and all of his possessions. Then one who had escaped came and told Abram the Hebrew, for he dwelt by the terebinth trees of Mamre the Amorite, brother of Eshcol and brother of Aner; and they were allies with Abram. Now when Abram heard that his brother was taken captive, he armed his three hundred and eighteen trained servants who were born in his own house, and went in pursuit as far as Dan. He divided his forces against them by night, and he and his servants attacked them and pursued them as far as Hobah, which is north of Damascus. So he brought back all the goods, and also brought back his brother Lot and his goods, as well as the women and the people. Abram was no lightweight when it came to war. Three hundred eighteen of his servants were trained warriors. However, he was doubtless outnumbered by the four kings who had taken Lot captive and who had already defeated a long list of kings in the area ... including all the kings of the plain. However, by the providence of God, Abram was tipped off as to the whereabouts of these invaders and their condition. So, Abraham devised a clandestine plan of attack. His strategy was a surprise, coordinated night raid on the camp of the invaders and he got the victory. However, make no mistake about it, Abram’s success was clearly due to the supernatural hand of God. David’s words to Goliath come to mind here, do they not? We come here to a very very important and key person in Scripture … namely, the priest/king of the city of Salem ... named Melchizedek. His name means king of righteousness and the name of his city, Salem, means peace. Salem would later become Jerusalem. We read here that Melchizedek was the priest of the Most High God. This is the first recorded priesthood in the Bible. It is important to note that it existed prior to the Levitical priesthood, which was established much later by the Law of Moses. The Bible says that Melchizedek is a type, or picture, of Christ. So, like Jesus, he was both a king and a priest and he reigned from Jerusalem as our Lord will also do one day. Furthermore, Melchizedek has no recorded birth date nor parents nor record of his death. He simply steps forth here on the pages of Scripture and then disappears. This circumstance of having no record of a beginning nor end strengthens his suitability to be a type of Christ … a point made in Hebrews 7. For this Melchizedek, king of Salem, priest of the Most High God, who met Abraham returning from the slaughter of the kings and blessed him, to whom also Abraham gave a tenth part of all, first being translated "king of righteousness," and then also king of Salem, meaning "king of peace," without father, without mother, without genealogy, having neither beginning of days nor end of life, but made like the Son of God (a Type), remains a priest continually. Now consider how great this man was, to whom even the patriarch Abraham gave a tenth of the spoils. And indeed those who are of the sons of Levi, who receive the priesthood, have a commandment to receive tithes from the people according to the law, that is, from their brethren, though they have come from the loins of Abraham; but he whose genealogy is not derived from them received tithes from Abraham and blessed him who had the promises. Now beyond all contradiction the lesser is blessed by the better. Here mortal men receive tithes, but there he receives them, of whom it is witnessed that he lives. Even Levi, who receives tithes, paid tithes through Abraham, so to speak, for he was still in the loins of his father when Melchizedek met him. The LORD has sworn and will not relent, ‘You are a priest forever according to the order of Melchizedek.’ The Lord is at your right hand; He shall execute kings in the day of his wrath. ...and from Jesus Christ, the faithful witness, the firstborn from the dead, and the ruler over the kings of the earth. To him who loved us and washed us from our sins in his own blood, and has made us kings and priests (Lit. : a kingdom of priests) to his God and Father, to him be glory and dominion forever and ever. Amen. One last note … notice that Abram refused to take any of the spoils from the battle for himself. He was highly protective of the fact that his prosperity was from the Lord’s hand alone … and no one else's.